Here's a superb new online slots game from Playson you can play. If you love going to the pub, Down the Pub online slots is set to make you feel right at home. There’s a large ginger-haired guy sitting on a pub bar stool, drinking beer. There’s pub food and a slots machine in the corner no less. The light-hearted piano music proffers a relaxing background and when you spin, the ginger-haired guy sips his beer and cheers you on from time to time. The sound of him drinking will make you thirsty too! Established in 2012 and headquartered on Malta, Playson is an up and coming online game supplier, who focus on high quality graphics and leading edge technology. 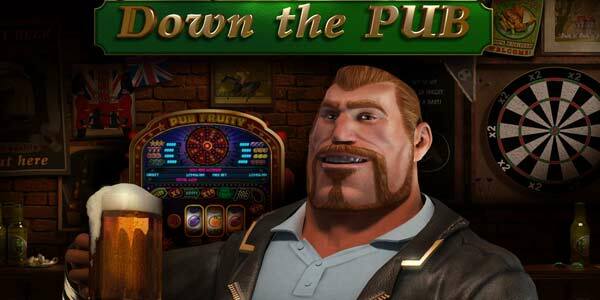 Down the Pub slots casino game has a 5 reel, 3 line and 15 payline format with free spins, multipliers and bonuses. Click I for information to take a look at the paytable and see what the various winning combos are. Or click the cards on the reels to display the information about them. There are two modes of play – advanced and basic. Advanced lets you set up the game for autoplay. Whether you play auto or not, place your bet to get started. Then spin away. The cards all reflect what you would find in a pub – pints of beer, beer kegs, nuts, pub food, beer mats with letters on, and so on. If the letters spell out BONUS from left to right across the reels, you trigger the bonus round. 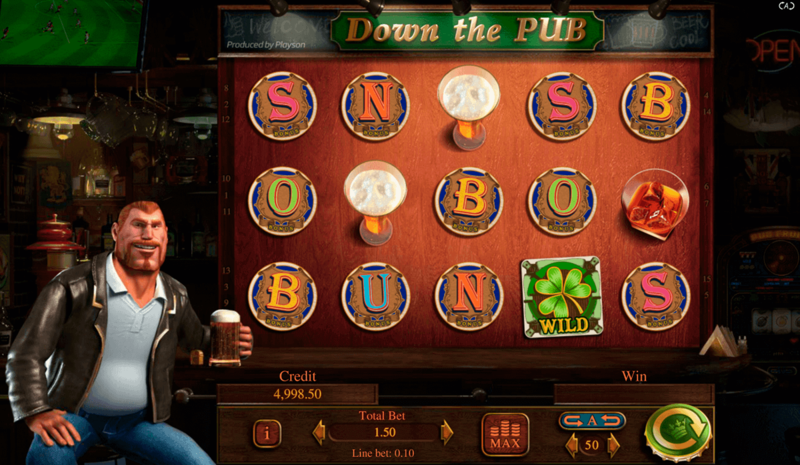 CLOVER – The three leaved clover is the wild in this game and substitutes all but the scatter symbol and the pint symbol during the free spins. WELCOME BEER MAT – If you get three of these in a spin, you get free spins. 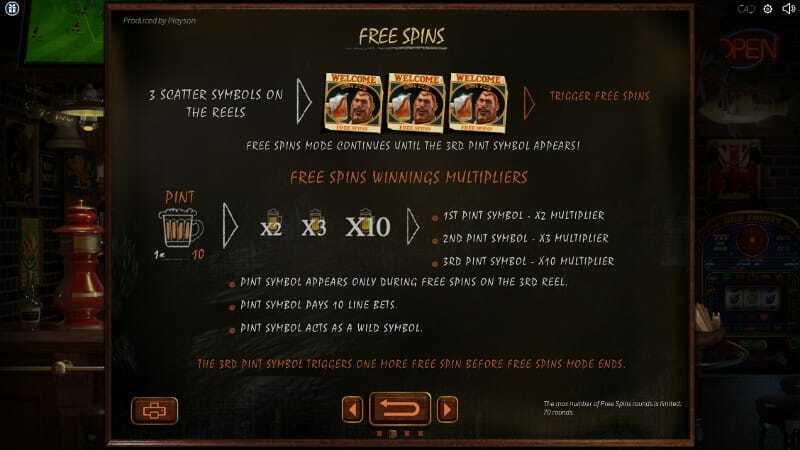 FREE SPINS – Triggered by three of the Welcome Beer Mat cards, these continue until the three pints of beer have popped up during the free spins. The pints are multipliers, the first one that appears doubles any wins, the second one triples any wins and the third multiplies wins by 10. After the third pint appears you get one more free spin before returning to normal game play. FRUIT MACHINE - If the beer mats spell out BONUS left to right across the reels in a spin, you trigger this classic fruit machine slots game with 3 reels. Each spin moves round the trail outside the reels and this can collect you nudges, boosts, jackpots, multipliers or bombs. You have three lives and this game is over when you’ve landed three bombs. This is a really nice game to play as you feel you are in the pub with your mates. You can play for free or for cash with opportunities to win free spins or a chance to play on the fruit machine.